In this report, wiiw researchers Vladimir Gligorov and Michael Landesmann and their co-authors Torbjörn Becker, Zsolt Darvas, Daniel Daianu, Pavle Petrovic, Jean Pisani-Ferry, Dariusz K. Rosati, Andre Sapir and Beatrice Weder di Mauro argue that in view of the depth of integration in Europe, the development model of the central, eastern and south-eastern Europe (CESEE) region, despite its shortcomings, should be preserved. But it should be reformed, with major implications for policymaking both at national and EU levels. If so, what are the required changes? 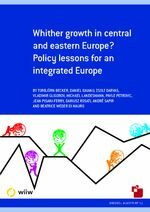 The European think tank Bruegel and the Vienna Institute for International Economic Studies (wiiw) cooperated to form this expert group of economists from various European countries to research these issues.